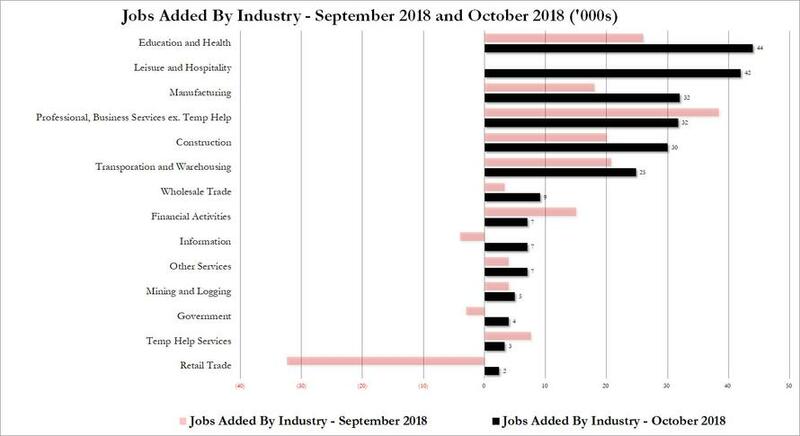 After a disappointing payrolls report last month, which was downward revised to 118K jobs mostly due to a hurricane impacting hiring and resulting in a sharp drop in retail and hospitality jobs, October was the payback month with many of the jobs "lost" in September coming back and headline payrolls printing at 250K, 50,000 more than the 200K expected. 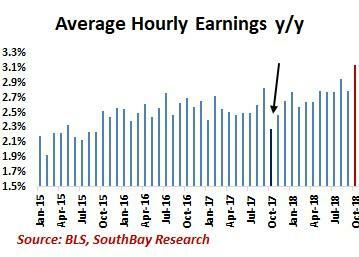 Notably, it was not just last month's hurricane which impacted the data, but also last year's duo of Hurricanes which negatively impacted hourly earnings in Oct 2017 as SouthBay Research notes. It was this weakness that created the "base effect" wage spike this month, resulting in the artificially high 3.1% average hourly earnings print, the highest since April 2009. Employment in the well-paying professional and business services increased by 35,000. Health care employment rose by 36,000 as hospitals added 13,000 jobs, and employment in ambulatory health care services continued to trend up, +14,000. Employment in transportation and warehousing rose by 24,000. Job gains occurred in warehousing and storage (+8,000) and in couriers and messengers (+8,000). Construction employment continued to trend up in October, up +33,000.